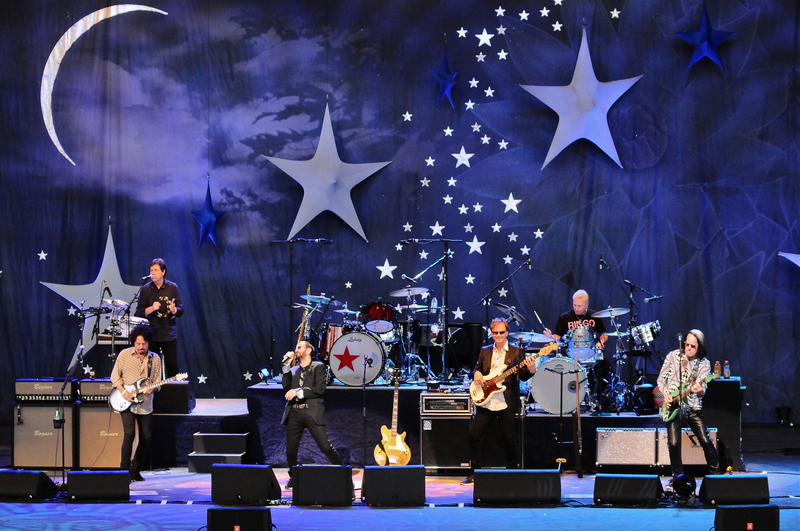 It was an extraordinary night of hits performed by Ringo Starr and his magnificent All Starr Band Saturday evening at the The Constellation Brands-Marvin Sands Performing Arts Center (CMAC for short.) His band was literally a who’s who in popular music and featured for the most part the same band he has toured with the past few times. This time around the only change was the insertion of keyboardist, saxophonist Warren Ham. The core of the band featured the drumming of Greg Bissonette, guitarists Steve Lukather (Toto) and Todd Rundgren. Rounding out the field were bassist Richard Page (Mr. Mister) and keyboardist Gregg Rolie (Journey & Santana.) The band sounded very tight with this being only the second date into a twenty-nine date run. The show started off with Starr front and center with a microphone as he opened with the Carl Perkins tune “Matchbox” a song later recorded by the Beatles. A pair of Starr solo tunes were up next in the form of “It Don’t Come Easy” and “Wings”. Perhaps the coolest aspect is that all the other members of the band get a chance to perform a few of the songs they are known for during the show. Rundgren was handed the ball first as he ripped into his classic “I Saw The Light”. “Evil Ways” was followed by Lukather’s “Rosanna” and Page’s “Kyrie”. Some of the highlights occurred during the mid portion of the set. With a big drum front and center, Rundgren came up to play his anti-work anthem “Bang The Drum All Day which drew a huge response from the crowd. “Don’t Pass Me By” featured the lightest moment of the evening as Starr had to start it over two times as he stated “I’m playing the wrong song” which brought some laughter from the forgiving crowd. The number one smash from Toto “Africa” went over like gangbusters as the band sounded tight in an extended jam. Starr took turns on the drums alongside main drummer Bissonette as well as coming out front and center when it was time to sing. A fresh sounding version of “Yellow Submarine” brought out a large audience participation and had the majority of the crowd clapping and singing along. Conceivably the best moment of the night vocally came from Page whose rendition of his monster song “Broken Wings” was quite vibrant. It was an unbelievable performance by the 61 year old Page who demonstrated he had not lost a thing in the vocal department. “Hold The Line” was no slouch and was a close second for song of the night. Starr chose to close out the affair with “With A Little Help From My Friends” before ending it all with “Give Peace A Chance” to no one’s surprise. As Starr flashed a final peace sign he bid the audience a fond farewell. Starr is no fool as he has surrounded himself with an amazing set of musicians. The set list was full of songs that a common fan would know and at the same time also gave Beatles fans a few bones with some of the lessor known songs from their enormous catalog. It was a win-win situation for everyone. Special thanks to Lynn Freida from Constellation Brands!